Just recently, we received a request for help from a client. The client was being very diligent and suspicious of incoming emails in her spam bin. This was a particularly tricky one which used the client’s own email address in the spam email to make it look like the client herself had sent an email out, and the spammer was just replying to that email. In this example, Jane Doe was our client and Jimmy Dean was the spammer. The hacker even included an unsubscribe link at the bottom of the fake email he intended to make the client think she sent out to appear legitimate. Be careful out there when opening emails you do not recognize! 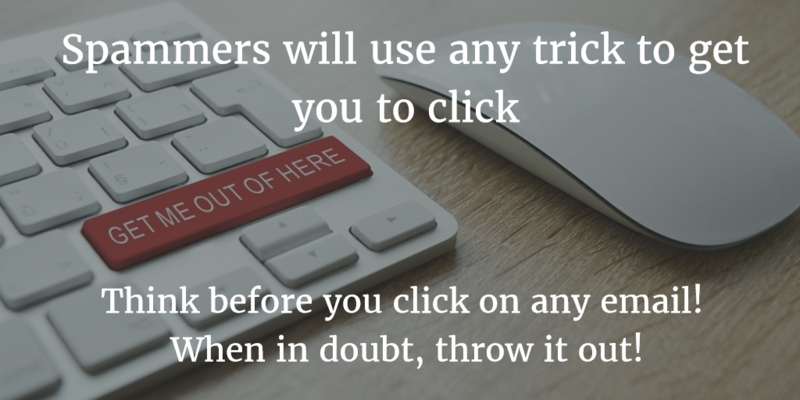 When in doubt, throw it out and think before you click! Greetings…….I have never paid this fee before…can you please check my contract to see if we agreed to that.